Thursday was a good day for an hour's drive over the ridges and along the rivers to my sister's home. A perfect day above and not so great below. It had, in fact, snowed at her place. No snow at mine. As I entered Kim's kitchen, the heavenly aroma of banana bread greeted me. Two loaves were cooling on the rack and soon the aroma of coffee also filled the air. The fire was crackling and hot and I sank into one of those chairs beside it. A fireplace in the kitchen is a tremendously pleasant thing. I am officially jealous. We chatted along for a good hour before we ever turned our thoughts to the dining room. 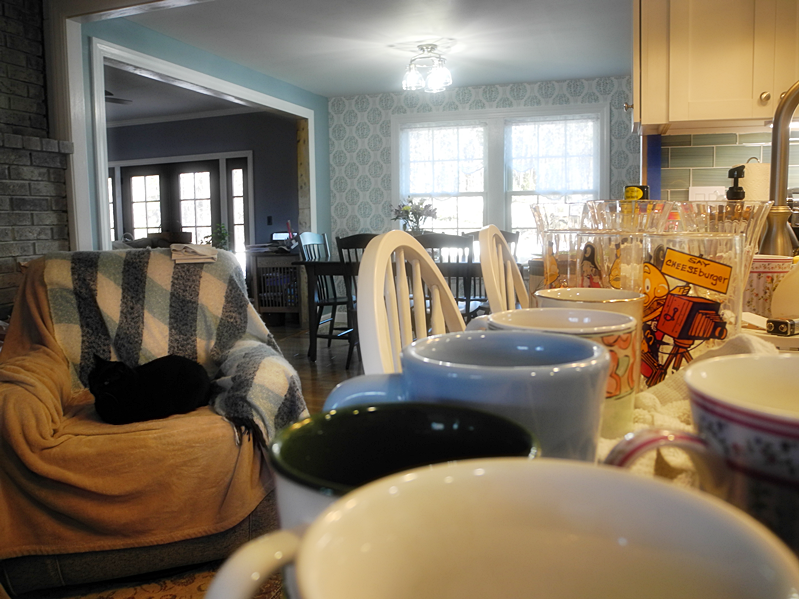 When we did, it was to unpack dishes that Kim hadn't seen for nearly ten years. That was fun. She found a few that are heading for her daughter's home and a few more that are headed for Goodwill. Thank goodness for dishwashers. Kim used hers even though some of the dishes were vintage stemware. She used the gentle cycle and none were lost. She did not wash anything with gold or handpainting. Then we cleaned the hutch itself more thoroughly. It has been in storage for a while and needed the attention. Soon, we had it gleaming and ready for some decorating. Course by that time, weary of our labors, we turned our attention to some tv while we took a break. An hour of that and we were hungry and took off for a late lunch at Olive Garden in Augusta. 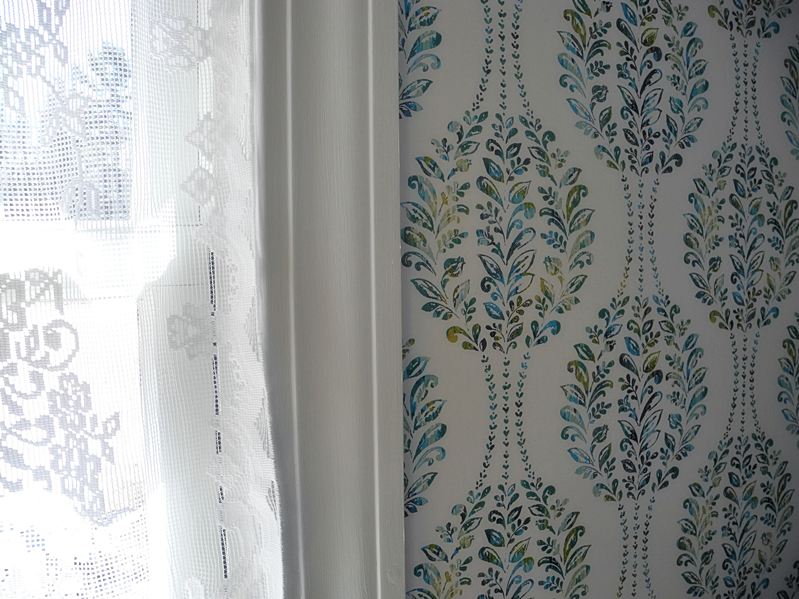 Oh I want to show you a close-up of the wallpaper because it has much more color interest than I first supposed. Looking in from the living room...love that Penobscot Wall where reclaimed wood was used for the wall application. The wood doesn't rot because of the low level of oxidization while the logs were submerged for over a hundred years. Do you have wood reclaiming industries in your corner? You can't go wrong to purchase some of that wood for decor purposes, though it is certainly pricey. What I love about this is that the hutch blends in perfectly with the overall look of what is going on. The table set doesn't match, but that doesn't matter with all the wood tones going on. That's a wrap for now. If Kim sends me a photo of the finished styling, I'll share. She's still looking for the rest of her dishes somewhere in the basement. I hope that she finds them because, until then, I've got nothing. Blog fodder is becoming so rare around here. A blessed and happy weekend to you! Like Martha, am not familiar with the wood preserving technique, it certainly looks great. My sister, who lives a few hours away from me, has a fireplace in her kitchen, like you I am a bit jealous. Sisters make the best of friends, I certainly miss spending time with mine, she is dealing with some health issues. The hutch is beautiful, is it maple or pine, I have a maple hutch that is similar in style. So looking forward to you sharing, BTW I always enjoy your blog fodder, would love for you to find some! I am finding that many are short on blog fodder, so how about you reviving it for all. Hi dear Vee. 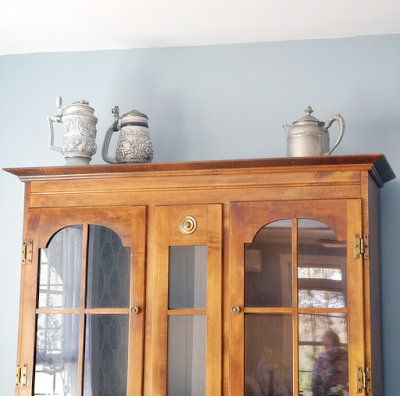 What a lovely trip to visit your sister - I can see you had a great time working on the hutch, which is beautiful - as is that reclaimed wood with so many natural colors. A fireplace in the kitchen must be so homey and comfy on a cold day. The wallpaper is very attractive as a feature wall, just enough of the large pattern (which is very popular currently) around the window. My dining room has the exact same sized double window. 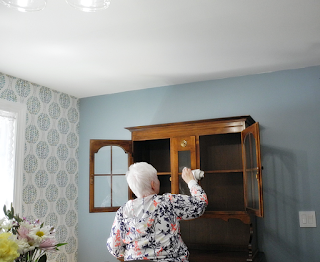 Please share a photo of the completed hutch makeover - I'm sure Kim will choose some beautiful pieces to display. Vee I seem to be having problems posting comments I received overnight - I saw one from you about the hoot owl and hit publish (along with another comment) but both have not posted and seem to have disappeared! I actually did it on my iPhone so perhaps it has something to do with that - apparently there is going to be a big 'something' happening with GPS today and phones may go haywire for a while - who knows - anything is possible in this tech world we now inhabit! Anyway, thanks for stopping by, hope you get a peek at your owl some day - they are amazing birds. Sounds like a wonderful day. Love that room, the wallpaper, the hutch, the table and chairs. That reclaimed wood is so cool. Penobscot is a new word to add to my vocabulary. So interesting about oxidation, etc. We have purchased a slab of Maple from a local Woodworking Network outfit down the highway from us. It's going to replace the bathroom counter in the 2nd bathroom at our country bungalow. We had it cut to size with an exposed natural edge. Dear has some sanding and staining to do and then will have to cut a hole for the plumbing of the sink. The sink is a floating sink that will sit on top of the wood slab. TMI? Hope you have a good weekend. At last! I am able to comment as myself in my own blog. 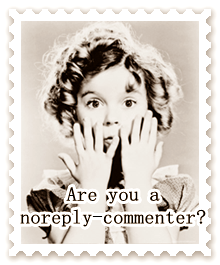 SNAFUs aplenty in Blogdom this morning. Further clarification on reclaimed wood. Logs buried for over a hundred years are brought up from their watery graves in Maine rivers and lakes and are sawed into planks for use in decor or furniture. I know that these types of businesses exist in other parts of the country. I have read about logs being brought up from the Mississippi River for example. The company that sold this wood was named Penobscot after the River. ☺ Reclaimed wood is probably the general term. This hutch is maple. The hutch is maple and the brand is Moosehead Furniture. Who cares whether the project was totally completed? You had banana bread and coffee and TV and Olive Garden and valuable sister time!! Sounds like a fabulous day! I think I need to make a drive to visit with my own sister. Sister time is good. I'll probably wait until after the wedding. That is my catch phrase these days: "after the wedding." I will need happy things to do then . . . It sounds like the perfect day spent with your sister. 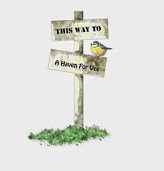 This is a very enjoyable post with the pictures of homey home decor, rich with treasures that mean much to the family. Loved also your honesty about needing a rest, and watching TV for an hour before going to the Olive Garden. You are blessed to have your sister living as close as she does. As far as reclaimed woods goes, barn wood seems to be a big thing down here...our son Adam in TN has done many cool things with some he's acquired. The love the dark woods against the lovely blue wallpaper. 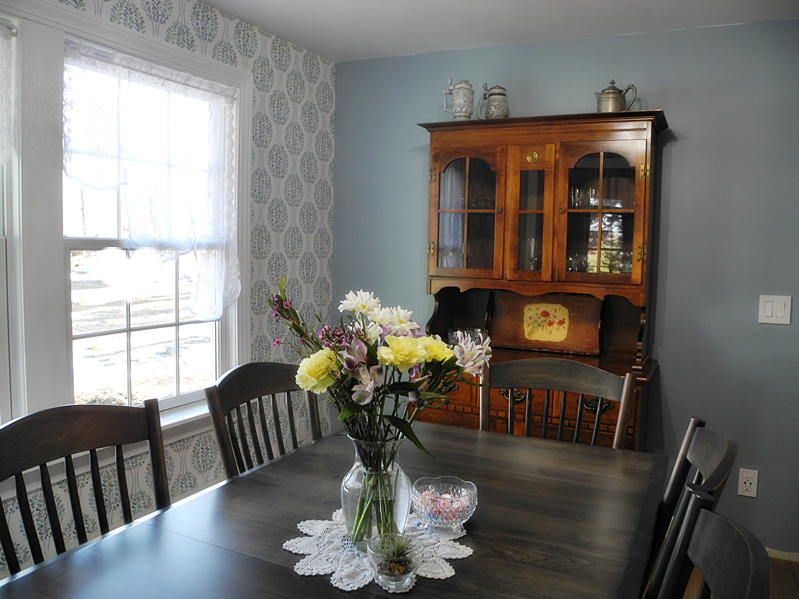 The pattern and colors are so pretty in the close-up and I don't thing the hutch has to be match-matchy with the dining set...it all looks so beautiful together. And boy, your sis sure has some pretty hair...sounds like a fun day to me! Sounds like a perfect day. I love the hutch and the wallpaper is lovely. That fireplace in the kitchen sounds wonderful. You had me at banana bread, coffee and chair by the burning fireplace! Heaven! Plus time with your sister and the bonus of lunch at the Olive Garden! It doesn’t get much better than this!! Yes, I was expecting a reveal of Kim's hutch, but I'm patient! I love the wallpaper design, and the reclaimed wood wall. Sister time is always fun! I love every sort of transformation! What happiness for your sister to see things she has not used for so long. 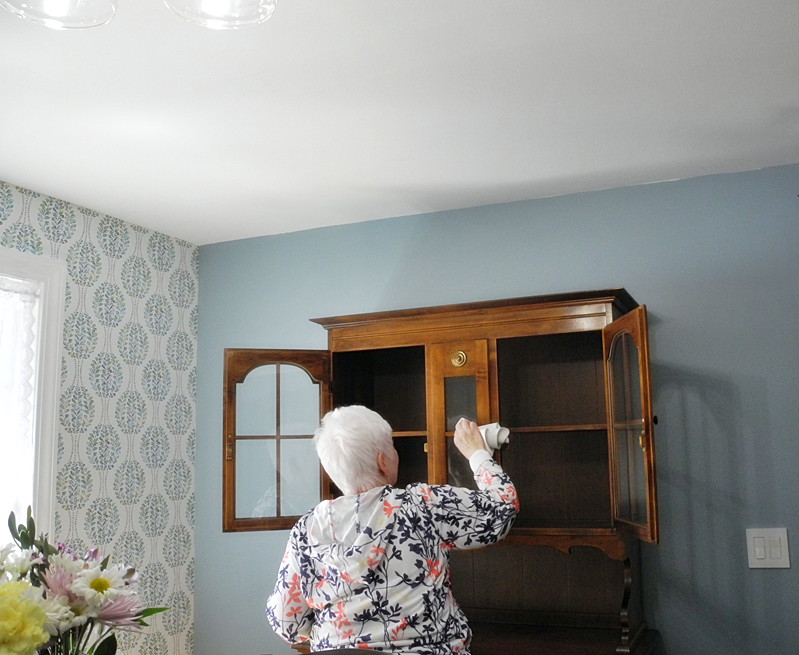 And what joy to clean the hutch until it sparkles! I have two hutch cupboards, one smaller one Paul and I bought long ago, and one I inherited from my grandmother in 1991. I love them both. I am waiting for more photos of your sister's new rooms. Perhaps I ought to have said "every sort of successful transformation". Your sister's certainly is! It's such a blessing to live close to your sister, I know it is for me as well. 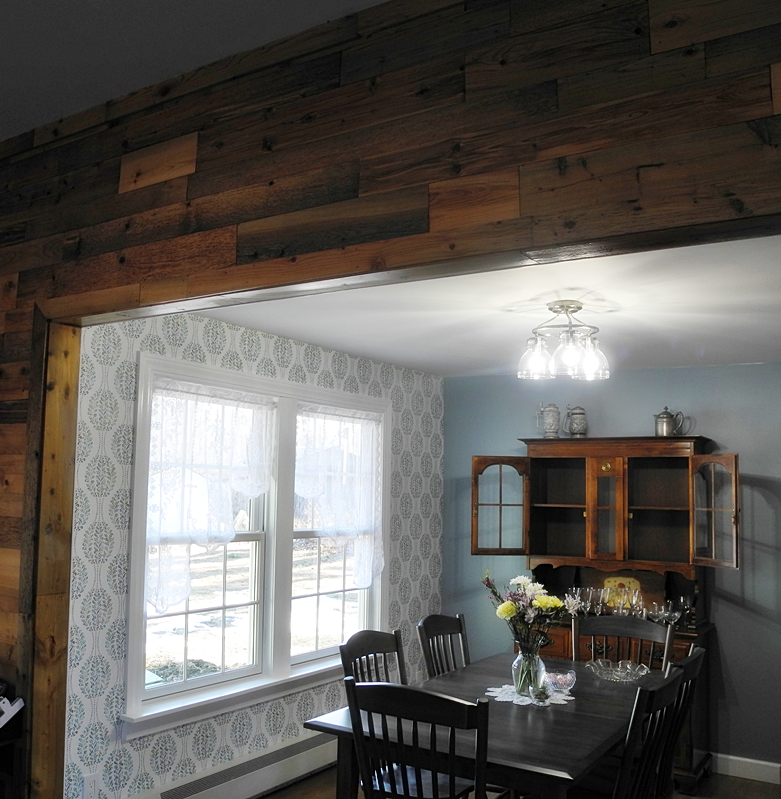 Her dining room is so beautiful, and I love color of the wallpaper, and the reclaimed wood! We don't have that in our neck of the woods, it sure is gorgeous. I understand about, blogging fodder, it's hard to come up with something to blog about...until next time! Banana bread and coffee... yum and yum!! Kim sure does know how to roll out the welcome mat. I was hoping for a full hutch reveal, but am equally satisfied with hearing about a fun visit between sisters. Brings back memories of time spent with my own sister. I love the wallpaper and appreciated the close up peek. Also nice to see and hear about the wood being reclaimed and restored to such beauty. If that goes on around here, I am clueless. Enjoy your weekend. The wallpaper is very nice. Like it a lot. The reclaimed wood is beautiful. Who cares about finishing a project? You spent some wonderful time with your sister. A fireplace in a kitchen is a very cozy attraction. I do love the look of the reclaimed wood. We have several companies here that reclaim submerged logs, old barns, and more. The wallpaper is very pretty and the cool blues of the room are a great contrast to the warm wood. Love that wallpaper! And the re-claimed wood. I'm a fan! There is lots of re-claimed wood in this house...100+ year-old fir from our old barn. It looks like you had a perfectly fine and fun day. I think you need to drive over that ridge again sometime soon and carry on where you left off today! Quality time spent with your sister is so much better than finishing a project. Although I must admit I am looking forward to seeing the big reveal. The wood looks amazing and the wallpaper a real delight. I certainly love the wallpaper and color of the dining room...very soft and serene! Thanks to Sara @ Across My Kitchen Table, I have now switched from Safari to Firefox and, thus far, my problem is solved. And! I even returned to the embedded option for comments. Yahoo! Her rooms are lovely! How nice to have a sister and to have one close enough to get together with! Everything about this day sounds perfect to me. Haven't had banana bread in a LONG time but now I can almost smell it. And glad to know someone besides my sisters and I spend most of our rare time together "chatting" about who knows what. But it' so wonderful isn't it? And oh a fireplace in the kitchen sounds soo warm and cozy. I love love love that wallpaper. The colors, the design, all of it. 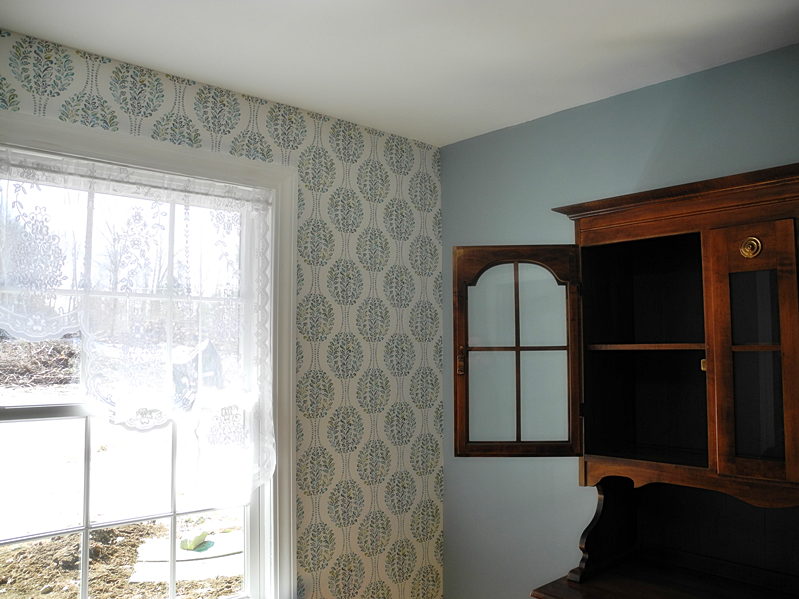 The hutch is super pretty too and I do hope I get a glimpse of it somewhere after it's finished. Hope your having a good week! Your sister's home looks lovely and seeing her beautiful hutch made me miss mine! When we moved west we purchased the dining set the woman selling our house had, so that we would not have to move the one we had in Brooklyn. We donated our Brooklyn dining room set to people who lost everything in Hurricane Sandy. I loved my old hutch--it was **a big purchase when we bought our Brooklyn home and I decorated it for every holiday, but moving it would have been cost prohibitive. It is nice you can spend so much quality time with your sister. Mine lives in AZ and does not like to fly, so we don't see each other often. I love that wallpaper (the colours in those patterns! ), I love that beautiful hutch, and I love that two sisters had such a delightful day together sharing and eating and loving time spent with each other. Wishing you a beautiful day, Vee! Sounds like such a nice day with your sister and what a warm and cozy welcome! Can't wait to see the final reveal and I love that wallpaper! Enjoy the rest of your week!! Wow, your sister has a nice home. I had noticed that wood wall, and I'm glad you explained how it was made. I can see how that would be pricey, but it sure is handsome. 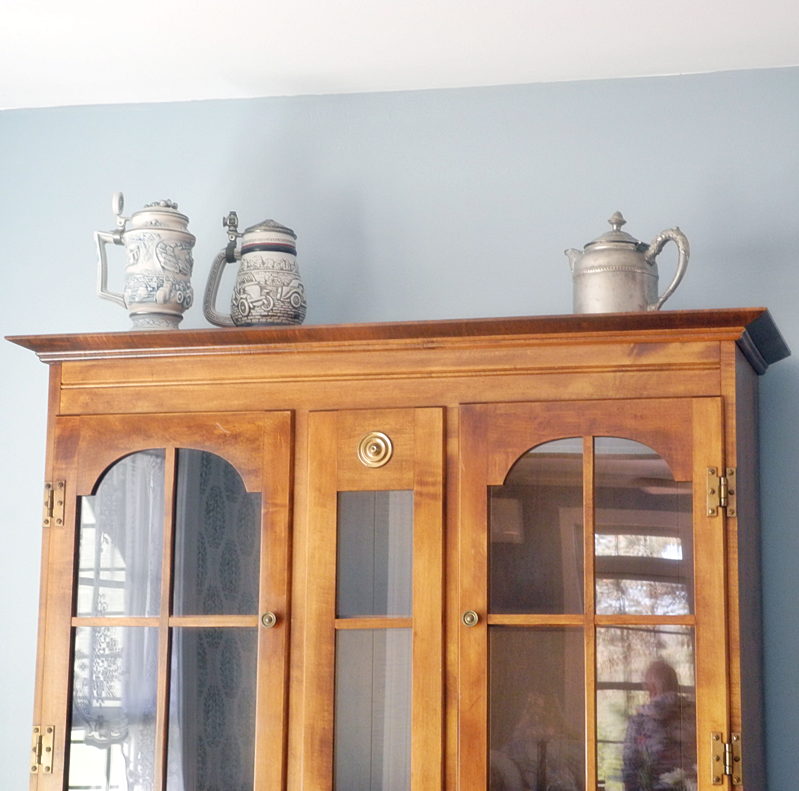 :) I also like the blue wall in her dining room (would love to get our dining room painted). 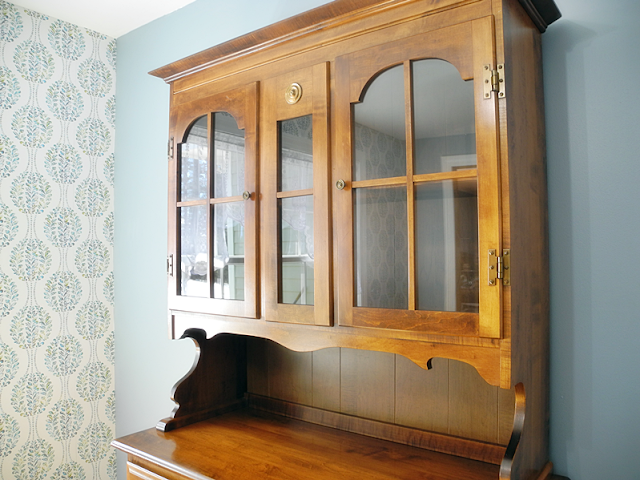 I love, love that hutch!! It reminds me of a Welsh dresser, except the shelves are closed in instead of being open. The design is so pretty and classic, and the finish is beautiful. It reminds me of golden maple or something similar. Her table and chairs are beautiful, too. I like that things don't all match because I can't stand to see matchey-matchey everywhere. 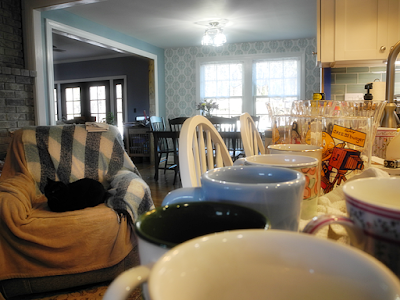 ;D My dining room table, chairs, and china cabinet are a match, but all the other furniture in there is random. I hope you have a great weekend, Vee, and glad you didn't get snow! A cozy kitchen and freshly baked banana bread?! Bliss! I'm late commenting since I had to stay away from computer screens for awhile. Stephanie and her husband had a custom dining table made from reclaimed wood. I haven't seen it in person but it looks beautiful in photos. I think the carpenters that made it are in or near Boston and are famous for using reclaimed wood. Sounds like a delightful visit (minus the snow!) The wallpaper is especially charming. This is Mildred. Saw you on Liberty Belle's blog and wanted to catch up again. Hi Mildred! Glad to have you pop back by. I have tried to be in touch, but nothing was working. Feel free to chat behind the scenes.